February | 2012 | Right Here..... Right Now.... Glory Be! Diet…… It’s Not About Me…. The Hubs and I just enjoyed a delicious after church lunch at Applebee’s, made even more enjoyable with the addition of a couple dear folks who joined us at our table. I had a steak with shrimp, a spinach stuffed portobello mushroom, and a veggie mixture of zucchini and broccoli. It was ab. so. lute. ly. delicious. Now it would always probably be a delicious meal, but it was even more so today because the Hubs and I are dieting. Oh….. you’ve heard that story before? I know; I know. It’s a never-ending tale. Believe it or not, I was once a skinny minnie. That lasted until my freshman year in college, and then it was fight-the-fat from that year on. I was so terribly thin as a child. Mom and Dad took me to the doctor, who ordered my tonsils out. The operation helped, but I remained puny. I had no curves, no shape; my clothes just hung on me or literally fell off. I still remember having to wear suspenders on my skirts and jeans to hold them up. When I was a senior in high school, I weighed less than 100 pounds. I simply breathed a prayer every day: “Lord, help me to weigh at least 100 for graduation.” I didn’t make that goal. But I more than made up for it in college. Part of the problem was my activity level. Although I am a very happy little couch potato, curled up with a book, I was exceptionally active as a child and teen. Living on a farm was part of that. I had to walk the pastures, searching for the cows and drive them up to the barn every night. We walked a half mile lane to catch the bus…. and back up that lane in the afternoon. I was in marching band and we marched for an hour in the mornings before school and then also during our band class. And then we marched in all those parades and at half time shows….. I ate copious amounts of food, but just burned everything off. Silly me. I never thought about the activity level changing so much at college. I kept on eating like a ravenous farm girl, and noticed around Easter that my spring clothes no longer fit. Back then, I tried this candy stuff (I think it was called Ayds), which was supposed to kill the appetite. Ha!!! It was so good, that I ate several pieces at one time… and the next day I killed off the box. I tried Weight Watchers, First Place (which actually did help me), Atkins. I did the grapefruit diet, and all the other frivolous diets that looked strange. Nothing really seemed to work for long term. I would get really really hungry, and then all good intentions just went out the window. I joined a gym, and later joined Curves. It was good for me, but I had to come to some realizations on just how my body worked. I also had to come to some realizations about WHY I wanted to lose weight. Was it possible that I had the wrong goals, the wrong motivation?? I’m a slow learner in many ways. It took me decades to realize that my body worked better on protein than on sugar. I found that if I could feed my furnace some protein at several points during the day, then I fared better. The protein kept me from that wolf-like hunger. Sugar made me jumpy and made me lose focus. I lost most of my sugar cravings, but I still craved carbs in the forms of breads and noodles and dumplings. I also found that fats satisfied my hunger. Unfortunately, I was still gaining weight. I had managed to stay between 130-135 most of the time when we lived in MO. That was still too much for my slight frame. But when we moved north, I began to eat…. probably out of depression over the move, and partly to occupy my time. The weight started to pile on. Going back on an Adkins style of diet helped some, but I really needed to lose more, and it just wasn’t budging. So the Hubs and I are now doing something different. We wanted to try and jumpstart our bodies in a more controlled way and began using Ideal Protein products. These are some high protein products that are controlled on carbs and fats. We use a couple per day for meals and one as a snack. Then we fill in with some other proteins, such as fish or chicken or beef, etc., and with lots of healthy veggies and salads. I was afraid that I would get hungry on this diet; hunger was what would derail me. The diet is very low fat and very low calorie. I was definitely hungry the first few days, but then that dissipated. Now the last couple of weeks, I haven’t even been hungry enough to have a snack in the evening. And I AM losing weight. I’m back down in the 130s range now after 5 weeks on the diet. My energy level is still high, I’m sleeping well, and feel great. So….. back to Applebee’s. I was afraid to eat out, afraid that I would be tempted to make wrong choices, afraid that I would cave and eat the fries (or whatever starchy carb was out there). The steak was supposed to come with potatoes and the grilled mushroom, but when I asked if they could switch the potatoes for veggies, they didn’t blink an eye. So I had my protein and my wonderful veggies, and drank 2 1/2 cups of water with lemon. I am full and feel great!!! Breakfast this morning was a high protein shake and coffee. Supper will be a big salad with more legal veggies. I’ll keep on drinking water, and tonight may have a high protein snack. I had visions of my weight just dropping off my bones in no time flat. That vision was shattered. But it is dropping slowly, and I’m grateful. I want to look good for my dear hubby, I want to fit in my clothes again, I want to maintain my level of energy, I want to be able to stick around for many years and play with my grandkids. But the main motivation I have is to glorify my God. After all, I am His handiwork; I am a Temple where Jesus lives. I take that seriously. Diet…. I hate it. But it’s not about me. It’s about honoring my God, and being there for all the wonderful people in my life. I am so grateful for the abundance with which You have graced us. And that includes an abundance of food. Please help me make wise decisions about my meals, using Your bounty with care. Help me to care for this body, which is fearfully and wonderfully made. I am so sorry for all the times that I abused it with my over eating, and ask for Your strength to do better. For Ever and Ever….. ?? I was folding laundry in the bedroom this morning, when our neighbor came over to bring the city newspaper. He and his wife are so kind as to share the paper with us. We moved to this home about 2 1/2 years ago, very grateful to find this nice of a home here that we could afford. And it has been a blessing to have good neighbors who share with us, who stop to talk, who look after our home when we are away. Anyway, the neighbor said that the obituary for the man who sold us this house was in the paper. The Hubs and I looked at each other in shock. Flashback to 2 1/2 years ago: We had been coming to this city almost every weekend to look for a house. Our house had sold (although we had started looking before it sold), and we had a time constraint on finding a new home. Frankly, it was discouraging. Nice homes, like we were used to, were out of our price range, and what we could afford were old, rundown, leaky, moldy, had poor layouts, no garages, small rooms, not enough space, in a bad area of town, etc. The real estate guy told us he had another place to show us: a place that actually had not even come on the market yet, but he had wind of it soon being up for sale. We went through the house and were immediately sold. It was an older home in an older neighborhood, but everything in the neighborhood and in this home were well taken care of. There were things that needed to be done to the home, but we could get around to those in due time. The roomy layout flowed nicely, and it was comfy…. homey. The agent explained that the husband was a professional who had been downsized. The stress from that had provoked a heart attack. So they needed to move. We entered negotiations about the house, and met the owners. They were very nice folks and we could tell that they had taken pride in the home. The sale was completed, and we all moved. …until the picture today with the obituary. I stared at the picture, with an unfolded T-shirt in my hands. I willed it to look like the former owner, and there were traces of the man I remember. He was so young…. much younger than Hubs and I. And despite the heart attack, he had seemed so active and vital….. and alive. Stenciled above our bed are words that the previous owners had placed: “For Ever and Ever.” I began wondering about when they stenciled it there. Did they think about how it might not be for ever and ever? Did they talk about how short life is? About counting their days? Did they cuddle right below this stencil, talking about their dreams of growing old together? I was sitting in the family room tonight. It is bitterly cold outside and we have a fire burning in the fireplace. I remember the previous owners being proud of that fireplace, and Hubs and I have been oh so grateful for it. I wondered: Did the previous owner stare into the flames, thanking God for the beauty and warmth? I looked out the window to the backyard, the deck, the bird bath that they left here. Did he enjoy that view as much as we do? There is a little pantry door in the kitchen. Did he ever open it and grab a snack, like we do? Did he wander into the sunroom with a cup of coffee and enjoy the early morning, like I do? Did he ever linger by the front door, enjoying the lake view across the street, like we do? I had a sudden urgent appreciation for this new home, and am sorry that I did not appreciate it as much as I should have when we moved here. My rhythms of life are being established here now; it feels like home. I’ve memorized the light switches, know the number of steps from the bed to the bathroom. I know what time the neighbor’s yard light comes on in the evening. I’m on speaking terms with the sump pump and its periodic groan. When I am gone from here, will a new owner sit in the window seat and watch the maple tree sway lazily in the summer wind? Will the new owners be mesmerized by the fire? 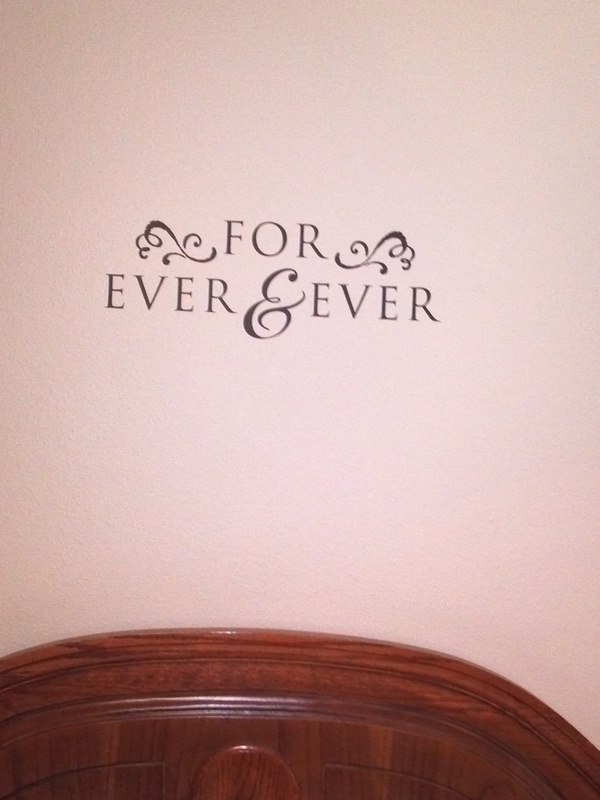 Will “For Ever and Ever” still be stenciled on the bedroom wall? Will they walk in the same rhythms? Oh Father! Life is so short! I can’t help but pray for the wife tonight, who knows that for ever and ever is broken here on earth. Let her find Your comfort. Please give me awareness of life, the beauty of life, the shortness of life, the sacredness of life. Let me make the most of my days, for Your sake. Amen. When I was in college, I used to have this panic dream that I had forgotten to go to class all semester (silly me…), and now it was time for the exam, and I was sure to fail (oh the shame…). It was always the same dream before exams. Then when I began teaching, I had a different kind of panic dream. This was where I found myself teaching, minus some necessary items of clothing. Or I wasn’t ready for class, and was so embarrassed. Or I had forgotten everything I knew about the subject. The bottom line was that I was unprepared. Those dreams continued through my career, especially just before school started in the fall. After so many years, they didn’t panic me anymore, but the dreams persisted. But I have been retired for 5 years now from full time teaching, and about 9 months from part time teaching. You would think the dreams would know enough to go away. But no. Last week, I had two of these dreams on two consecutive nights. The first one was that I was teaching “Death of a Salesman” by Arthur Miller. This is one of my all-time favorites to read, to study and to teach. My lectures and activities were firmly grounded in my head. I wanted the students to see parallels between themselves and the world they live in, with Willy Loman’s world. It’s a great morality play! Anyway, I was lecturing about some of the symbolism in the play: Willy’s name, the sons’ names, the garden, etc. I reached a blank. I knew there was much more I needed to say, but absolutely nothing was in my head. In my dream, I was just staring at my students in bewilderment, and they were staring at me in bewilderment. I knew that I needed to give them a test. But the scene was suddenly not in a classroom, but in a house, and my students were all over the house, out on the porch, and sitting in cars in front of the porch. How in the world could I give a test to them when they were scattered all over? I would have no control over the testing situation. It was going to be a multiple choice test (which was strange, as I didn’t give this type of test), but in this “house” situation, that would only lead to cheating. So I did what I often did in teaching: I changed gears very quickly and found a different way. I announced that this was an essay test, and everyone had a different question. There! That would solve it! And then I remembered how much time it took to grade essays….. and I woke up. The next night, I dreamed that I went back to DHS (the last school for which I taught full time), to substitute teach. I had forgotten where everything was: strange after 20+ years in that institution. I couldn’t find the teacher mail boxes, so I just didn’t check for mail. I was lost trying to find the classroom, and ended up missing the entire class. The hallways were a maze and a jumble, and I was just blindly trying to find the room. I thought I was close one time as it was supposed to be Room 4, and I found Room 3 and Rooms 5 and 6, but Room 4 was nowhere to be seen. I tried to find my way back to the office, but even that was futile. I woke up feeling so bad about not doing my responsibilities. Why oh why do I have these dreams? I know that back to school dreams are common with teachers. Not sure if other professions have similar types of dreams or not. I was told that I had the dreams because my career was very important to me and that I wanted to do my very best. True….. But why am I still dreaming? Father, thank You for the opportunity of a wonderful career in teaching. Not everyone can retire thinking and knowing that they enjoyed their work. Thank you for all the people who have been on this journey: students, fellow teachers, parents, and staff. I have been blessed beyond measure with a feeling of success in teaching, of knowing that I made a difference in some lives, and with the acquaintance and friendship of many folks that I otherwise would never have known. It is by Your grace that all this occurred. May the skills that You gave me in teaching still be used for Your glory. Even though I don’t know why I have had these dreams, I thank You for bringing my teaching years back to mind.